This receiver monitors signals from all visible navigation satellites (GPS, GLONASS and GALILEO). Similar receivers are also located at Ny-Ålesund, Hopen, and Bjørnøya, providing wide coverage over Svalbard and the Barentz Sea. Each receiver stores detailed information about the signal amplitude and phase, in order to study how the signals are affected by plasma irregularities on their way through the ionosphere. This information is also used to calculate the plasma density in the ionosphere (Total Electron Content; TEC). The Scintillation and TEC receiver. 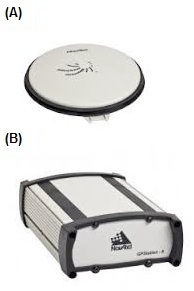 NovAtel GPStation-6 receiver and GPS-703-GGG antenna with multi-constellation capability (GPS, GLONASS and GALILEO). The receiver has 120 channels, and for each visible spacecraft in the sky the scintillation indices (S4 and SigmaPhi) and Total Electron Content (TEC) are calculated at 50 Hz resolution and every 60 s.